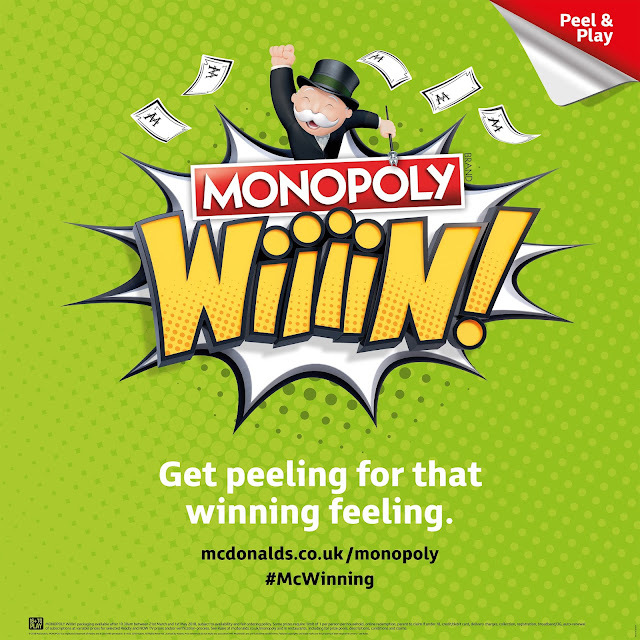 The eagerly anticipated Monopoly campaign returns to McDonald’s on 21st March for the thirteenth consecutive year. Called Monopoly Wiiiin! this year’s promotion encourages customers to ‘Get peeling for that winning feeling’ through the peelable game pieces featured on the promotional packaging. The campaign, licensed by Hasbro and created by The Marketing Store, aims to drive brand affinity and engagement across McDonald’s restaurants nationwide. The campaign will be supported by marketing via TV, radio, press, OOH, DOOH, CRM campaign, social (Facebook, Twitter, Instagram and Snapchat), digital as well as the online site and game. The Marketing Store has developed the website and social aspects of the campaign, including the campaign’s Snapchat lens which lets users turn themselves into Mr Monopoly or when turning to world lens view, allow them to interact with a dancing line of Chicken McNuggets® - bringing that winning feeling to life. The campaign also sees the introduction of McDonald’s first branded hashtag emoji on Twitter for the new campaign hashtag #McWinning. Leo Burnett London has handled creative for TV, Cinema, OOH, press and radio. Customer excitement began back in February with a pre-tease social post released the day after Valentine’s Day reaching 5.7 million people on Facebook. Monopoly Wiiiin! also sees McDonald’s introduce a new piece of technology to the McDonald’s Monopoly Campaign website. Customers taking part in ‘Got 10 Spares?’ – a new mechanic which was introduced last year, has a new piece of OCR technology added to it. Customers are now able to scan their spare property game pieces, with the OCR technology recognising the unique codes on each piece, making it even easier to collect 10 spares and exchange them for a NOW TV Pass. The new technology was introduced after market research conducted by Big Island identified McDonald’s customers wanted easier ways to interact online. A record pool of 70 million prizes is up for grabs and includes £100k in cash; a choice between the Mini Cooper Convertible or the Mini Cooper 3-door Hatch, a trip for 4 to Universal Orlando Resort™ as well as 500 Xbox One X consoles, and not to forget a choice of millions of instant win McDonald’s food prizes and more. Sav Evangelou, Executive Creative Director at The Marketing Store, said: “McDonald’s Monopoly is one of the most anticipated brand campaigns of the year. Monopoly Wiiiin! builds on the success of the 2017 Monopoly Win Win game, which awarded a record of over 12 million prizes and delivered millions of online entries.